In other news, Golfers in Palmetto, Florida were recently shocked to see 15' to 16' giant alligator strolling across the course. Many are comparing him to a dinosaur or a monster from a horror movie. In fact, an employee of Buffalo Creek Golf Course said that this particular alligator roams the area all the time and even considered by some to be a 'mascot' of the course. Word is that this is a great place to come and play. Texas has some of the best Courses and Resorts in the Southern United States. June is the perfect time to Golf in Texas, with average temperatures from the mid 70's to low 90's. With your Golf Card International Discount Golf Card, you can save hundreds at 63 courses in Texas alone! With courses located all across the State of Texas, you should not have a problem finding a course or 'squeezing in' that round. 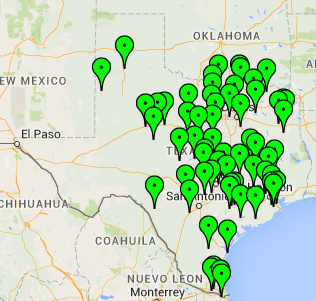 Click Here to see all of the Golf Card International participating Golf Courses in Texas.